Skiing doesn't have to be expensive. Here are some self-catering deals this Easter with Pierre & Vacances that'll make a difference. With two bank holidays and schools closed for two weeks, Easter is a great time to get away from it all. With a perfect dose of snow. Easter falls late this year, Easter Sunday on 21st April. Which is no matter at all after the handsomely heavy snowfall this season. There's going to be great snowpack and lots of opportunity to take to the slopes in April. To celebrate, Pierre et Vacances, the king of self-catering holidays in Europe, is offering customers up to 20% off. Not only that, but flexible booking dates too across a range of accommodation for Easter period breaks. That's as well as free kids ski passes at special locations. And check out the PlanetSKI Deals Club for all kinds of ski holiday packages and savings. Residence Les Temples du Soleil in Val Thorens is one for groups and big families. Les Temples du Soleil is a ski-in, ski-out property. Why not bring the grandparents, or even the dog, so that they can enjoy the buzz of central Val Thorens too? Residence Les Constellations is located in the centre of Belle Plagne. It's a stone's throw from the ESF school and has ski-in, ski-out access to the Paradiski area. Each apartment is south-facing and has a balcony or sun terrace to enjoy the afternoon sun from. Located at the top of Arc 1800, ski-in, ski-out Les Alpages de Chantel has impressive views of Mont Blanc. Little skiers don't need to venture far with the nearby ESF Jardin d'Enfants just around the corner. Each apartment has warm Savoyard décor, stylish furniture and a functional kitchen. 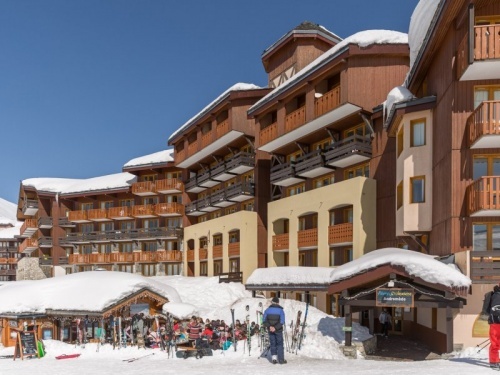 Le Village at Arc 1950 provides a wide range of ski-in, ski-out accommodation with great access to the Paradiski area. The Paradiski is made up of Les Arcs, La Plagne and Peisey-Vallandry. Each apartment is warm and cosy with fantastic facilities to accommodate two to 10 guests. The village also has free introductory sports sessions for the entire family. There's also a Deep Nature® Spa and an indoor/outdoor swimming pool.